Women in Iran face several gender-based inequalities since gender gap between women and men is one of the most persistent and prominent social gaps in traditional Iranian society, which is in transition phase towards becoming more modern. Due to socio-cultural factors there are challenging dominant repressive characterizations of womanhood reflected through standards of beauty, sexuality, and gender roles. Gender equality and women's empowerment has been growing over the past decades, women are at the forefront of change, working collectively to demand their rights. However, the condition is still very complex for women who are recovering drug addicts, as women's addiction is a taboo in Iran. These women who also mostly suffered abuse, poverty and prejudice deal with several physical and mental health issues, they fail to express emotions, make meaningful connections with other people, and do normal day-to-day activities or pursuit any goals. It results in lack of self-esteem, isolation, depression and failure of recovery attempts. 'Art Therapy' which is proved to complement psychotherapy, is an integrative mental health and human services profession that improves the health through creative process, especially art mediums such as textile art that engages hands and mind at the same time and doesn't require complicated training. The practice of weaving dates back to more than 20,000 years ago, as one of the oldest human's invention. Textile art that includes weaving, embroideries, tapestries, fiber arts, carpet design and more has undergone a significant transformation during the past century. It is and artistic media whose creators were exclusively or mainly women, excluded from the realm of "fine art" and merely described as 'woman's work' or 'craft'. The 1970s, is definitely the turning point for textile art as artist activists and feminist artists such as Judy Chicago and Miriam Shapiro pushed the boundaries and challenged the traditional definitions of art. They succeeded to change the perception of what can be considered as textile and how textile is an art medium. Today movements like Craftivism are exploring the possibilities of using various forms of needlework as a form of 'gentle protest'. 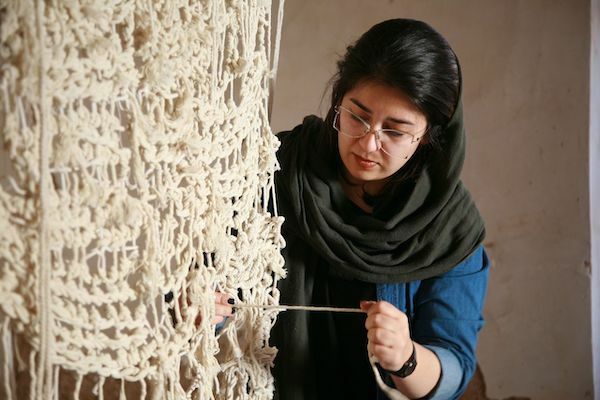 A group of Iranian women textile artists and designers are working on series of installations, each artist is creating her installation with a help of a group of women who are recovering addicts to provide them with creative healing opportunities, sense of meaningfulness and satisfaction. It is a collective effort towards female empowerment. The exhibition is called 'WOMEN C(A)REATE' since these artists are trying to show that they care and prove that recovering addicts can create and be creative too. The exhibition will be held in Tehran at Niavaran Cultural Center, one of the oldest and few spaces designed and built specifically for artistic and cultural events. Their works will cover and color the space to peacefully and quietly protest the fact that society is ignoring and isolating these women. It encourages general public and elites including politicians and decision makers to hear and support them. Elnaz Mohammad Tehrani is an independent curator, service designer and architect. After studying architecture in Tehran, she worked a number of years as an architect. She studied Product Service System Design at Politecnico di Milano University. Her motivation is "change making" to achieve any kind of Social Innovation, believing in the power of design and the act of making. She is also interested in developing new experiences that could provide innovative solutions, always putting the users at the center of the process. Tehrani is the founder and director of OBJET, which supports design culture by offering an exhibition platform in Tehran. Anahita Rezaallah is an Architect from Tehran, Iran. Currently she is based in Milan, Italy where she works as an Architect and Urban Planner, and teaches at Politecnico di Milano University where she completed both her MSc and PhD in Architecture with a focus on sustainability. She uses her spare time to design and make limited edition furniture. Rezaallah researches the possibilities of addressing issues of contemporary cities and transitioning societies through public art and art installations, and is interested in issues of identity, equality, social inclusion, environmental impacts and women?s empowerment.